Track spread of the avian bird flu. Click this map to take you to the BBC news site on avian bird flu. From there you can select dates and time on an interactive map, and view the spread of bird flu. Cick this bird flu map to download a 300k .pdf avian flu map. 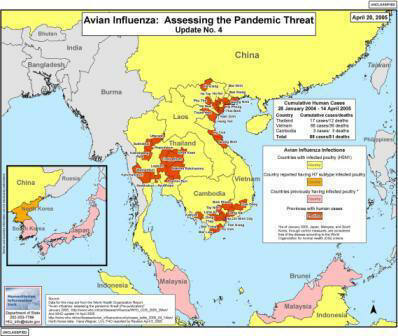 This map is from relief web and can be downloaded from their bird flu map site.